When you land at Chicago O’Hare International Airport try stopping at one of the airport’s many restaurants and lounges to refuel from your flight. From there you can begin enjoying this historic city. Chicago’s one of the biggest cities in the country, and because of this there are a lot of interesting things to do both outside and inside the airport. Whether you’re planning to chow down on a world-famous hot dog or enjoy the general scenery, O’Hare International is the perfect place to usher in a process that’s not only quick, but comfortable. 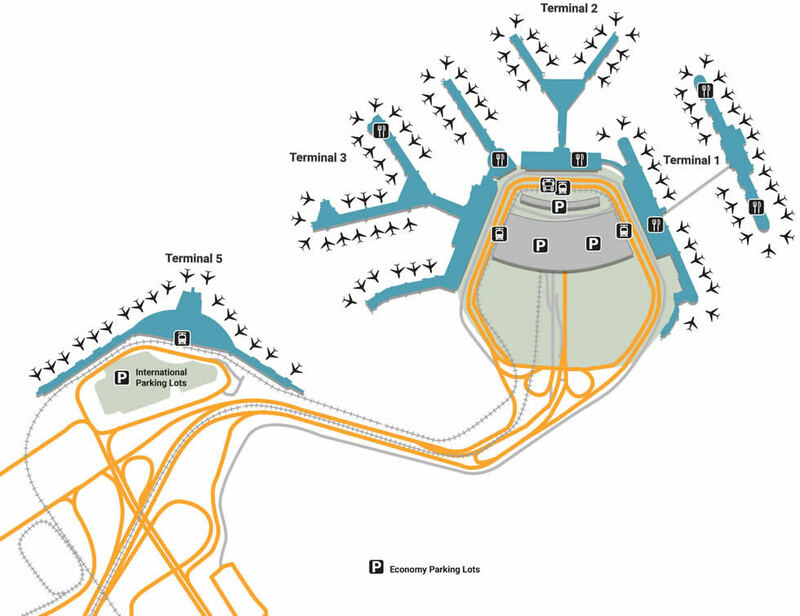 With five separate lots, you’ll be able to get to each terminal without hassle. If you’re picking up passengers or being picked up for an ORD airport transfer, stop in the hourly lot, located on Level 1 in the main garage adjacent to domestic terminals. Daily Parking is located in the same garage, but on Levels 2-6, offering just as easy access, but for up to 24 hours. Those planning to leave their vehicles for more than 1 day should utilize the low cost of the Economy E Lot, but for those planning to stay weeks, perhaps months, Economy Lot G offers even better deals. Both Economy lots are located at the corner of Bessie Coleman Road and Zemke Road. Countless adventures await outside the facility, but if you’re stuck waiting inside, there are just as many little things to enjoy. The airport provides free Wi-Fi throughout all the terminals as well as power stations with counter space that’s perfect for catching up on work or charging up your phone. There are also several Lost & Found locations, including one at food service locations, specific terminals, and administrative offices. There are lactation rooms at Gate B10, E5, M14, as well as an especially calming one by the rotunda near the yoga room and the Aeroponic Garden. If you’re traveling as a family, show the kids a good time by showing them the ‘Kids on the Fly Exhibit,’ located at Terminal 2 past security. Whether it’s the start of your trip or the end of it, shopping is a killer way to kill the time. Make your flight interesting by getting the latest thriller at Barbara’s Bookstore, located in Terminals 1, 2, and 3, or look good on arrival by getting the coolest purse in COACH’s (Terminal 5) window. If it’s your first time in The Windy City, grab a memorable souvenir at I Love Chicago, located along the Terminal 5 shopping strip. Top off your last few minutes with a quick massage or exfoliation from the kind hands at XpresSpa (Gate M11, Terminal 5). Why whine when you can dine? Wash away your worries at Argo Tea, a small cafe that offers a relaxing atmosphere and soothing drinks in Terminals 2 and 3. For a pitcher and some steak, head over to Chicago’s own Billy Goat Tavern and Grill (Terminal 1), or satisfy your sweet tooth with a mouth-watering slice of cheesecake at Eli’s Cheesecake (Terminal 1). Try out more of Chicago’s greatest delicacies by enjoying a footlong at Gold Coast Dogs, a common downtown eatery located in Terminal 3’s food court.